The divisions of the gatekeepers. The lot for the East Gate fell to Shemaliah. The lot for the East Gate fell to Obed-Edom. The lot for the South Gate fell to Shuppim. This is what I read the other morning in my personal devotion time. After reading the Bible I try and meditate on what I have just read and try to find a spiritual application for my life. I must admit that while studying Chronicles I have often not found a spiritual application to help me through my day. This morning was no exception. CHRONICLES – So many lists, so many names, so little time. I am the gardener at Foundation For His Ministry’s Home For Needy Children in Oaxaca Mexico. Mowing a large field full of weeds was on my To Do list. Mowing a large field with push mower gives me a lot of time to think. I began thinking of the Christian Doctrine class I started teaching to high school students in the city of Oaxaca. We are studying the inspiration of scripture. The Bible is inspired by God and every word is truth. We hear and read many words everyday. Probably thousands of words. The only words that we can be sure are true and directly from God are the words we find in Holy Scripture. It is a great practice to begin each day with the Word of God, and let that Word influence our day. This is what I wanted to say to my class. But what about the parts of the Bible like Leviticus and Numbers and Chronicles, where we find lots of lists and numbers and geneologies? What about lists of gatekeepers? How can that possibly have any bearing on my life? I asked God that same question and I believe he gave me an answer. I thought about the city of Jerusalem and its gates and the gatekeepers were in charge of. 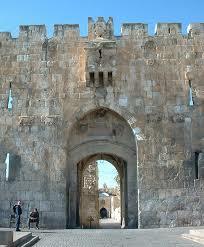 Anyone who wanted to harm the inhabitants of Jerusalem or do the city mischief would have to pass through those gates. So the gatekeepers had an important job keeping bad people out. I thought of the women’s prison across the street from the mission where I go every week to teach English. There are four gates or check points that I must pass through to get to my class. The first two are operated by the state police who are armed with large machine guns. They want to see my identification and want to know why I am going there. I gladly show and tell rather than face the business end of their big guns. When I finally get to the prison, I knock on the large metal door, and a guard opens a little peephole door to see who is there, and he also wants to see I.D. and know my purpose. When he lets me in I must hand over my I.D. and sign in. Then my bag is searched and I am given a pat down. I proceed to my final check point where another guard writes down my name and purpose for being there, and I am finally allowed in with the inmates. All of these checks make it safe for the inmates, the guards and for the visitors like me. The gatekeepers for Jerusalem and for the prison have a very important job. So what about the spiritual application? Well, God seemed to be saying to me that there are areas of my spiritual life that need gatekeepers. My mind. My heart. My lips. The gatekeepers? The Bible. The Holy Spirit. Other Christians. The Bible talks a lot about our minds and the way we think and what we think about. The Bible, in Paul’s letter to the Romans says we need to have our minds transformed; renewed. How is this accomplished? Philippians tells us to think on things that are true, honest, pure, noble and good. In a sense that is a family of gatekeepers, similar to a family of gatekeepers that were assigned as gatekeepers for one of the gates in Jerusalem. We need to seek and depend on the Holy Spirit to think on the good things and not allow bad, worldly, enemy things to enter. The enemies that want to infiltrate our minds, hearts and lips are the World, the Flesh and the Devil. When I think of other Christians who are the gatekeepers of my mind, I think of writers like C.S. Lewis and R.C. Sproul, who speak to my intellect and help me think right thoughts. We not only need gatekeepers for our mind, but also our hearts. By “heart”, the Bible normally means our desires and what motivates those desires. Everyone is motivated by the desire to be happy. How one seeks happiness is important to consider. Our enemies, the World, the Flesh, and the Devil, give us a hundred ideas per day on how we can be happy. We need the gatekeeper of the Holy Spirit and the Bible to reveal to us the true path to happiness: The real things like forgiveness of our sins as we forgive others. A righteousness that is revealed from heaven through Christ that brings true joy as we live in right relationship with God. The Puritans address heart issues, and they have becomeone of the gatekeepers of my heart through some of their prayers as recorded in the book The Valley of Vision. 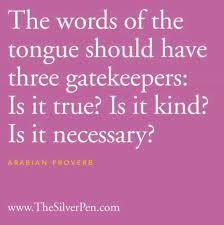 The last part of our being that needs gatekeepers is our lips. Jesus said that out of the abundance of our heart the mouth speaks. There is a direct connection to what is in our minds, to what is in our hearts to what comes out of our lips. If we start the day filling our minds with scripture, that affects our desires and motivation for the day, which guards what comes out our mouths. Paul said in Ephesians 4:29 that we should not let any wholesome talk come out of our mouths, but only those words that are helpful in building up fellow Christians according to their needs. Proverbs 10:19 says that he who controls his lips is wise, and 13:3 tells us that he who guards his mouth keeps his life, he who opens wide his lips comes to ruin. We must also lean heavily on the work of the Holy Spirit in our lives to control our lips and gaurd our mouths. Two Christian writers that have helped me to accomplish this are Dietrich Bonhoffer and Henri Nouwen. So there it is. Who would have thought that an obscure passage from 1 Chronicles could have such an impact on our spiritual lives. I don’t have Shelemiah, Obed-Edom or Shuppim as the gatekeepers of my mind, heart and lips, but I do have the Bible, the Holy Spirit and other Christians to protect me from my enemies, and that makes me happy!